“ACT Alliance recognizes the deep and mutually enriching connections between religion and human rights. As a matter of fact, long before the current human rights instruments were developed in the 20th century, there were religious communities that upheld human dignity and advocated for people who suffered from exclusion and discrimination.” – Rudelmar Bueno de Faria, ACT Alliance General Secretary. 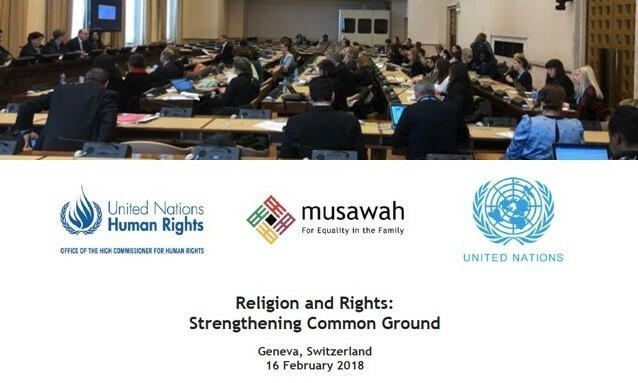 On February 16th 2017, ACT Alliance participated in a seminar on ‘Religion and Rights: Strengthening Common Ground’ at Palais des Nations in Geneva, Switzerland. The seminar was organized by Musawah in collaboration with OHCHR and the Inter-Agency Task Force on Religion and Development. The purpose of the Seminar was to promote dialogue for a rights-based understanding of religion to build common ground between faith and human rights actors. ACT Alliance’s General Secretary, Rudelmar Bueno de Faria spoke at the seminar on Faith-based engagement: Building Partnerships with Governmental, Intergovernmental, and Civil Society Sectors. Discussions noted the need for a greater common ground between faith and rights. “Often, people of faith speak about love, generosity, and compassion and not so much about legal frameworks, entitlements, duty bearers and rights holders. But what does ‘love’ mean when it is not related to justice? And what does justice mean when it is not related to legal frameworks?” said de Faria. ACT Alliance commits to accompany and challenge its members to deepen their understanding of human rights, and is working to promote dialogue and a cross-disciplinary reflection on faith and human rights. In addition to building common ground between faith and rights, ACT Alliance encourages FBOs to more effectively engage with international systems and develop strong partnerships with governmental, intergovernmental and civil society sectors. “The globalized context within which we live has presented an opportunity to bind humanity together in new and positive ways. However, it has also fueled new and growing levels of inequality, polarization and new forms of vulnerability for people and communities everywhere,” said de Faria. Seek partnerships that allow for funding to theological formation on important issues requiring moral discernment.